Your agent sends you the scenes for your audition, and if you’re lucky, the script too. You take the time to read the script. It gives you information about the story, the characters, and the relationships. Then you start to work on the scenes that were picked for the audition. You feel prepared as you go into the room. But your nerves take over and everything that you worked on goes right out the window. Now all you’re left with is FEAR. I am here to tell you how to fix this problem. Preparing the audition scenes and reading the script just isn’t enough. It’s so easy to get stuck in your head. To get out of that, you start thinking about the moment before. But then the moment before becomes just that – the moment before. It’s not enough to make you believe the most important part – “I am this person living this life.” The scenes, (I like to call them “slices of life”) which are NOT written, are the ones that allow you to sew the pieces of the quilt together. Without those unwritten scenes, there is a whole part of the life that is missing, causing you to “act,” not live the life. 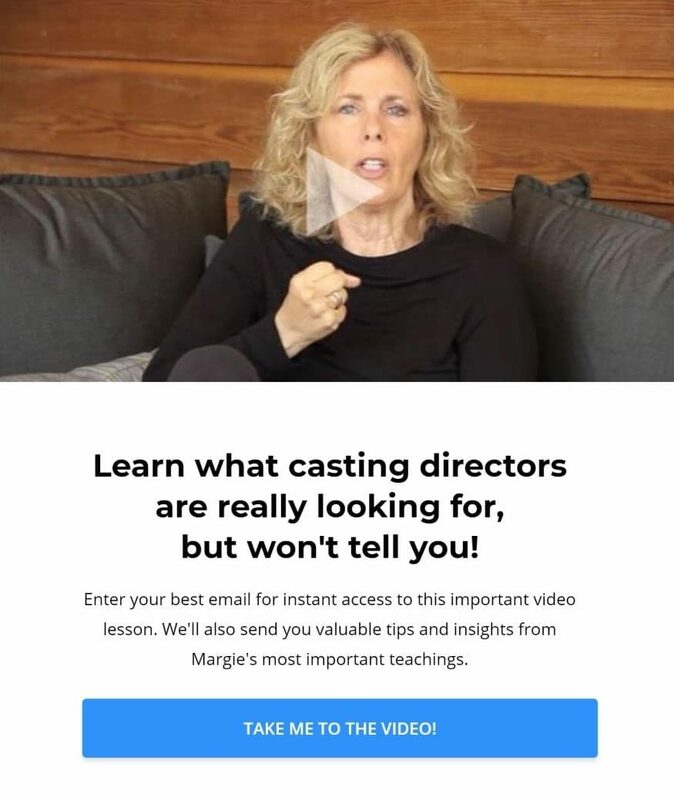 I have been fortunate enough to work with thousands of actors over the past 35 years, not only at the Margie Haber Studio in Los Angeles, but throughout the world. Most of them have gone to many acting classes that have taught them intellectual preparation, “What is my overall objective? What is my back-story? What actions do I need for every line?” And guess where all those questions land you? In your head! The worst thing for an actor is to live in their brain, versus experiencing our lives all through our body. At my studio, we teach all of our classes on-camera and work on audition “slices.” The camera works as an X-ray- allowing us to see what’s working and what’s not. What always works is being specific. And to create specificity, the relationship is the foundation, not the story nor the character. The journey in life and in acting is taking a dance with the other person, not shutting yourself off to play your idea. By living the slices of life that aren’t written in the script, we also get to use the muscle of imagination that never fails us. There is an expression, “The truth will set us free.” When you create the slices not written in your imagination, you start to believe the circumstances and play an idea. Life is filled with images and senses that you have created and will not forget, it will be yours! You know what is the best part? You will enjoy “LIVING A LIFE” and have fun again! Isn’t that really why we became actors in the first place? !